G & R Tree Surgeons are a family business based in North London and established in 1984. We carry out all aspects of tree surgery, including tree pruning, felling and stump grinding to BS3998 throughout the Greater London area and Home Counties. We have extensive knowledge on caring for trees, and the relevant expertise you need. Our operators are all fully trained and compliant with Health & Safety regulations. We offer reliable services and affordable prices. If required: we have a Z20 access platform for hire with a qualified operator. 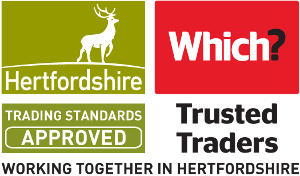 G & R Tree Surgeons are accredited members of ‘Safecontractor’; a recommended trader of ‘Which’; ‘Arbnet’ approved; on various other local authority approved contractor lists for Tree Surgery and an associate member of the Arboricultural Association and the Royal Forestry Society. Please do not hesitate to get in touch, we look forward to hearing from you. The second time I have used G & R Tree Surgeons- they are efficient, good value, get the job done and leave the place tidy. They were careful with not damaging any shrubs and fencing. Antony and James were both polite and extremely helpful. I would recommend them anytime. I would recommend them. Nice people to deal with and they do a very good job including clearing up. But do make sure they only cut what you want . Their intentions are good. But their idea of what will be best, may not be yours. In my experience it is not enough to just tell the men when they come. One needs to watch and maybe stand over them when there are surrounding branches one does not want touched. As a result of the November storm we had a tree that was rotten at the base, left in a wobbly dangerous condition. G & R Tree Surgeons promptly came out and surveyed the work and emailed a quotation the same day. They came two working days later to remove the tree. Dealing with their office was very pleasant. The work was carried out very skilfully, avoiding damage to the fence on which the tree could easily have fallen, and also the garden. All residue of the tree was thoroughly cleared up. We couldn't be more satisfied. At the end of January 201I I asked Richard Kemish for advice and an estimate for carrying out various items of tree pruning. He is very knowledgeable and obviously has a genuine interest in making sure that his treework is aesthetically attractive. The written estimate submitted within a couple of days was precise and business-like, with full details of his insurance cover. Although I did not engage G & R to carry out the work on this occasion, I would not hesitate to ask Richard to quote next time.